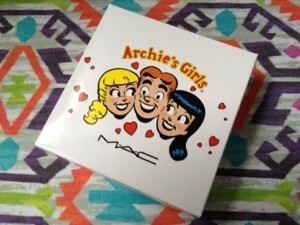 To say I was a little excited about MAC's Archie's Girls collection is an understatement. I love vintage/retro styles and these really appealed to me. I had originally planned to buy some bits after my spending ban in March, but after finding out that the launch was happening early at Selfridge's last week, I pretty much ran down there after work to get my hands on them! The one item I was really longing for was the Pearlmatte powder in Veronica's Blush. 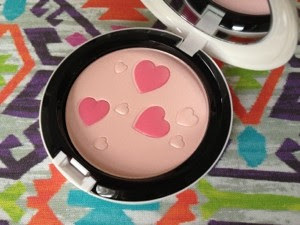 This is my first powder product from MAC and I fell in love with the heart shaped design that was embossed into it. Veronica's Blush is a pale pink, slightly shimmery powder with small darker pink hearts inside it. 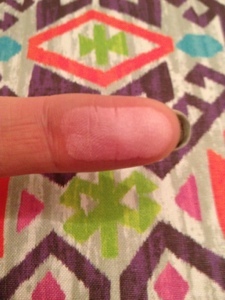 When mixed together, they form a lovely soft pink sheen. I've been using this product as a highlighter. Although it contains a darker colour, this is quite soft and I don't think offers enough pigment to use the powder as a blush. The packaging is very different to MAC's usual black offering, and I know not everyone likes it. I actually love it! 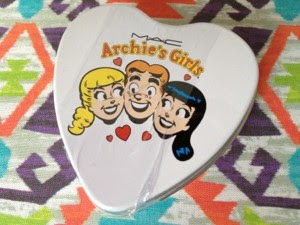 The powder compact is white plastic with the 3 Archie's Girls characters printed on the top, and has a good-sized mirror inside so is perfect for using on the go. As part of the launch, if you bought any product from the collection, you also got a cute little Archie's Girls tin with some little sweets inside. This just made my day! Veronica's Blush is currently exclusive to Selfridge's and costs £21.50. I believe that the range will be launching across MAC stores/concessions over the next few weeks. The inside detail is so cute! isn't it :) I couldn't resist! This blush is so cute. I love the packaging and the heart design! I want.. I neeed , I'm ON a flippin spending ban!